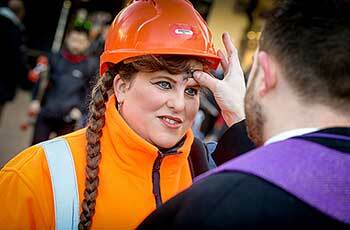 Ash Wednesday is the day when churchgoers up and down the country will have their foreheads marked with ash in the shape of a cross. But Church of England members will also be taking to the streets to reach out to the public, with shops, stations and markets as the backdrop to this centuries-old tradition. Commuters heading to work around Croydon tram station will be offered a moment of calm from members of Croydon Minster, which they’ve tagged ‘Ash n’ Dash’. Those commuting in Bristol will have the opportunity throughout Lent to tap into ‘Bristol Time’ each morning, which is a 10-minute reflection repeated every 15 minutes for an hour in Bristol Cathedral. Meanwhile shoppers and office workers on their lunch break will be offered ashes and prayer cards in Derby, Guildford and Cambridge city centres, with church members promoting their activity on Twitter using #AshesToGo. This hashtag has inspired High Wycombe C of E school to provide ashing to parents and pupils at the end of the school day. Members of St Mary Abbots Kensington are offering ashing on the street corner at the three busiest times of day, while St James Piccadilly are manning a 7-hour drop-in session. Building on past success, a group of clergy from varying traditions in the deanery of Hadleigh are working together to offer ashing outside Benfleet Station and Tesco Southend, using #AshMob. The Revd Edward Stock said it’s a great opportunity to reach out to those who might not be able to get to church and also offer them prayer. Similarly, in Halesowen the Bishop of Dudley, alongside the Archdeacon and Diocesan Secretary, will be asking if there’s anything people would like the clergy to pray about for them.